2 Maccabees is a Jewish work composed during the 2nd century BCE and preserved by the Church. Written in Hellenistic Greek and told from a Jewish-Hellenistic perspective, 2 Maccabees narrates and interprets the ups and downs of events that took place in Jerusalem prior to and during the Maccabean revolt: institutionalized Hellenization and the foundation of Jerusalem as a polis; the persecution… of Jews by Antiochus Epiphanes, accompanied by famous martyrdoms; and the rebellion against Seleucid rule by Judas Maccabaeus. 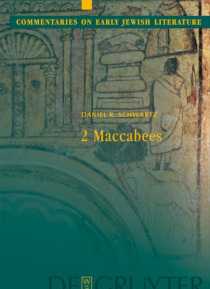 2 Maccabees is an important source both for the events it describes and for the values and interests of the Judaism of the Hellenistic diaspora that it reflects - which are often quite different from those represented by its competitor, 1 Maccabees.